Currently our packaging line runs at ca. 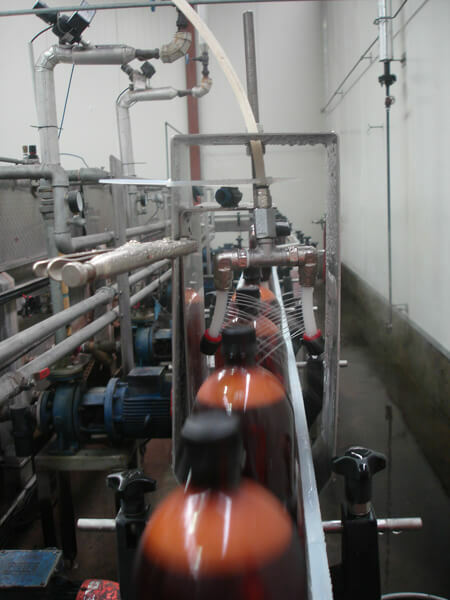 200 bottles per minute, allowing us to produce 100hL per shift. We cold fill carbonated and non-carbonated beverages into 275, 330, 340, 500 and 750mL glass non-returnable bottles sealed with twist and pry-off crowns or Aluminium ROPP closures or PET bottles (1L-2L) with plastic closures. By using our data-logging temperature probe we can accurately verify the extent of biological product stabilization achieved by our tunnel pasteurizer. Further microbial assessment can be performed by an independent laboratory if the customer requires. We are able to tailor our multi-headed labeller to apply a wide range of label types and sizes to the customers requirements. Full traceability is provided by coding the bottles with our inkjet machine, while cases are also able to be coded. Cases are tape-sealed and can be palletized, shrink-wrapped and dispatched or loaded into containers on site and shipped overseas or around the country. However contact us if you have any other bottle/pack sizes as we are very adaptable.